I don’t know about you, but something “wielding unimaginable power in the service of a will not their own” doesn’t sound like the type of thing I want in the hands of my enemies… Luckily for us aggressive players who use offensive occult units, we can get these guys fighting for our own team. Well, it’s a Legendary Unit. And what’s a Legendary Unit, I hear you ask? Plarium says: “Each additional Offensive Legendary Unit that is joined by supporting units receives a bonus to their Offensive capability”. In layman’s terms, this means that Legendary Units get stronger if you send out the right Units to support it. The more Units you attach to support the Legendary Units (to a maximum number), the bigger the bonus they’ll receive. 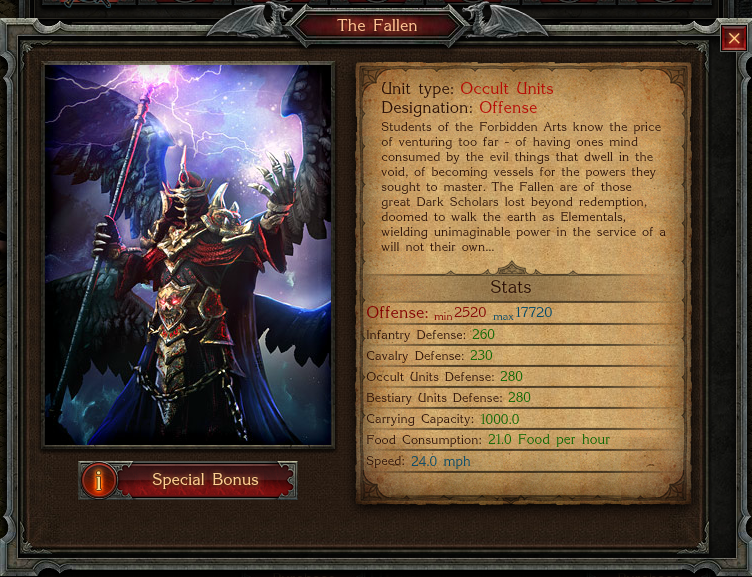 In the above screenshot, you can see the bonuses each Unit grants to The Fallen Units when sent out in support. For example, if you send out 10 Eldritch Necromancers, your Legendary Unit will receive a +6650 damage bonus, making it a massive force in battle. The more Units you send out in support, the more fearsome it will be and the greater the bonus (up to a maximum of 15200 for this Unit, of course). Right now! No need to mess around or fulfill any crazy requirements, you can get it right now from the Black Market and help yourself rise through the ranks. Like I said, the Black Market! 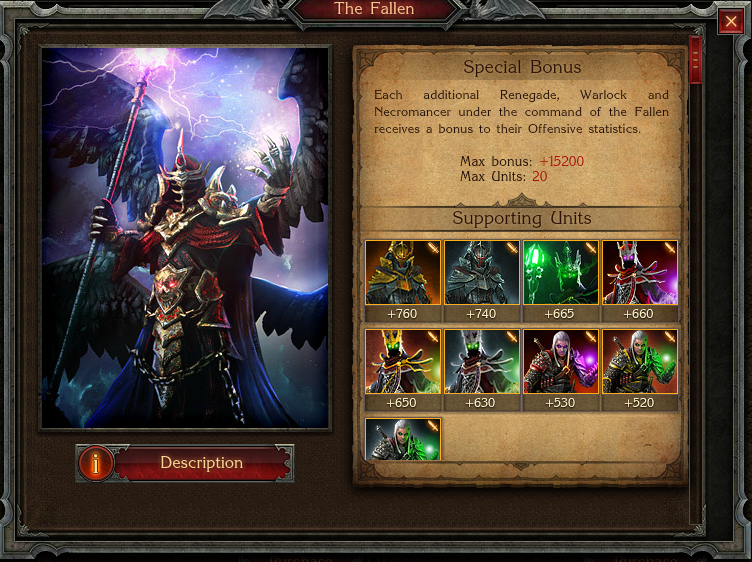 However, being an Offensive Unit, The fallen is what you want if you have Necromancers and Warlocks going into battle or raids. Because they are awesome, incredibly powerful and just the mere sight of one in your ranks is enough to scare most enemies away. Not that you’d need to, though; when you’ve got a few of these Units and the correct supporting party fighting in your army, you’ll be more than a match for the other Lords and Ladies in Stormfall: Age of War. On a technical level, the multiplier grants the Offensive Occult units in your army massively increased strength, which means more power in your attacks, more enemies killed and even saves you a lot of money in reviving troops. If they don’t die, there’s no need to spend money reviving them! If you think about it, it’s like a money saving investment! Get a few of these in your army and you’ll be flying up through the ranks in no time. Dust the cobwebs off your wallet and spend the coin! If you were considering spending some money on the game anyway, you can do a lot worse than spending on a few Legendary Units. Think about it; less troop loss, more troop destruction, money saved on reviving – it’s a no-brainer!